The Merrimack County Stamp Collectors will hold its monthly meeting at the Bow Mills United Methodist Church, 505 South St., Bow, on January 15, 2019 beginning at 1 pm. We invite all who are interested in stamp collecting to attend, share their interest, buy, sell and trade. Meet other collectors and learn more about their hobby and enjoy the fellowship of others with varied interests in Philatelic resources and issues. Gain new insight and knowledge, sharing news articles and stories about stamp collecting. For more information call Dan Day at 603-228-1154. Thank you for two terms you voted me as your State Representative. My very first bill was for property tax relief, using the remaining money from the Tobacco Tax, not used for education. That failed. My second bill, to remind the State to upgrade Main St., Pittsfield. Another bill required excess funds from State Agencies to be deposited in the "Rainy Day Account." When the funds reach one hundred million dollars, the remaining monies are to be dispersed to municipalities equally. That failed. Surprise, Chris Sununu, starting his budget with zero monies. All monies remaining from the Hassan governorship would be deposited in the Rainy Day Account, Every municipality got equal shares. Pittsfield got road repairs and sidewalks around the schools. Dan's Pumpking Bill, to legalize pot. I was the first to introduce a Pot Tax, requiring pot taxes to be used ONLY for property tax reduction, dispersed equally with municipalities. A troubling bill for me, the court assessment fee, was to be used for "Victim of Crime Funds." The Police Standards and Training Council was receiving 66% of that court fee, over three million dollars yearly. The remaining fee divided between the courts and the Attorney General's Office. Still no money to the victims. When the dust settled, the Police Standards and Training Council receives their funds now from the General Fund. Also a kicker, twenty-two new police cruisers. No money to the victims. Those funds must be over six million dollars. Still not a penny for the Victims of Crimes. May the new year bring on better governance. A family of raccoons had been hanging around the farm for a few weeks. Sometimes when I drove into the barnyard after dark, I'd see them hurrying from the tractor shed (where we keep the chicken feed) across the barnyard. Raccoons are wildly cute with thick fur and adorable masks, but their charm is no protection against rabies. Rabid animals will randomly attack other animals and people. They foam at the mouth and stagger around. My raccoon bite was clearly a defensive measure; he didn't mean anything by it. He just wanted to get away. Later that night a Google search told me that 25 percent of raccoons carry the rabies virus. This virus can incubate without symptoms for up to a year, which means even if the raccoon that bit me wasn't rabid at the time, he still could be a carrier. There is no test for rabies except by observation of the animal or by autopsy. My raccoon had made himself unavailable for either method. My other option was to get post-bite immunization shots. But if farmers rushed off to the doctor for every injury, we'd scarcely have time for the back-breaking labor we're so fond of. Besides, it seemed like a minor bite, not worthy of medical attention. Nevertheless, my disinclination to get treatment was soon set straight by sobering information. Dining at a friend's house, I met Ann, a health professional who communicates with the Center for Disease Control (CDC). She told me that people are still dying painful deaths from rabies. In one recent case, a man who had a live-and-let-live attitude toward the hundreds of bats in his attic must have been bitten without knowing it. Or maybe he knew but didn't realize that bats generally carry the rabies virus. In any case, he contracted rabies and endured two weeks of agony before he expired. Ann, who regularly processes rabies claims, also told me that treatment can cost up to $8,000! You can imagine how an uninsured person might choose thrift over caution. But I have Medicare, which would be sure to pay some of it. So rather than playing Russian roulette with my life, I decided, no matter what the cost, to get the post-bite shots. Twenty years ago a bite victim would receive a series of 10 shots painful shots to the stomach, but now only six shots to the arm are required – three on the first visit and the rest staggered over 10 days. None of them were painful. Of course, the best protection is immunization before the bite. That's what I do for my livestock; each animal receives one $10 shot that is good for a year. But humans require more than one shot. The nurse at Walk-In Care told me that because humans are more delicate than livestock, a full dose given at one time would stress our systems. So the necessary amount of vaccine must be spread over several days. The farm and I are rabies-free. The family of raccoons is gone. Maybe after chomping on my hand, they decided there was tastier food elsewhere. 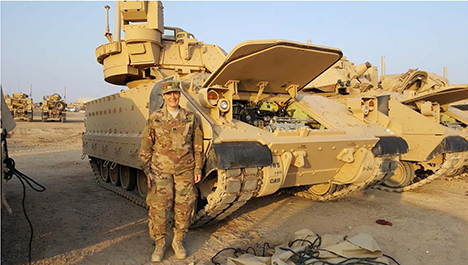 Captain Cynthia Thompson of Pittsfield is currently deployed to the middle east along with other members of the New Hampshire National Guard’s 1986th Contingency Contracting Team. She is stationed at Camp Buehring near Udairi, Kuwait. Camp Buehring is located about 25 miles from Iraq. It is the headquarters of U.S. forces in the area and serves as the staging post for these forces. The deployment is in support of Operation Enduring Freedom (Spartan Shield). Cindy serves as the Contract Administrator Officer in Charge of Camp Buehring’s 408th Contacting team, Combat Sustainment Brigade. The mission includes contract oversight as well as daily operations of the unit. She has been with the New Hampshire National Guard for 12 years and is on her second deployment. 5) Substantially disrupts the orderly operation of the school. The University of New Hampshire Cooperative Extension’s Understanding Bullying (https://extension.unh.edu/resources/files/Resource001364_Rep1823.pdf) provides us with very helpful information and suggestions on addressing bullying among our children. According to this report, 30% of school-age children report having been victims of bullying, and 30% of school-age children report that they have bullied another person. (These figures closely mirror Pittsfield’s data, according to our most recent Health Risk Behavior Survey in 2017.) It has been reported that more than seven million cases of bullying are reported in public schools nationwide each year. • Help kids understand bullying. Talk about what bullying is and how to stand up to it safely. Tell kids bullying is unacceptable. Make sure kids know how to get help. • Keep the lines of communication open. Check in with kids often. Listen to them. Know their friends, ask about school, and understand their concerns. • Encourage kids to do what they love. Special activities, interests, and hobbies can boost confidence, help kids make friends, and protect them from bullying behavior. Bullying is often underreported. Despite the fact that about 30% of our students have confidentially reported that they have been bullied, our schools receive only a handful of reports each year. Students, parents, and families are encouraged to report suspected incidents of bullying, either by using the district’s reporting form (http://www.pittsfieldnhschools.org/sau/wp-content/uploads/2016/04/JICK-R.Pupil_.Safety.and_.Violence.Prevention.Bullying.Reporting.Form_1.pdf) or by speaking directly to an advisor, teacher, administrator, or any trusted adult. • Do intervene immediately. It is ok to get another adult to help. • Do separate the kids involved. • Do make sure everyone is safe. • Do meet any immediate medical or mental health needs. • Do stay calm. Reassure the kids involved, including bystanders. • Do model respectful behavior when you intervene. • Don’t ignore it. Don’t think kids can work it out without adult help. • Don’t immediately try to sort out the facts. • Don’t force other kids to say publicly what they saw. • Don’t question the children involved in front of other kids. • Don’t talk to the kids involved together, only separately. • Don’t make the kids involved apologize or patch up relations on the spot. While we may or may not agree with the African proverb it takes a village to raise a child, I believe that it takes a community to eliminate bullying among our children and youth. If we all do our parts, we can support our children and eradicate bullying from our community. Please do not remove the yellow safety chains in front of the construction and metal boxes. The insurance company has mandated a barrier between pedestrians/vehicles and the access to the containers. Also, the first construction area has been re-designed as a bunker to allow for dump trailers to empty directly into the space thus eliminating dumping debris all over the concrete pad. The speed bumps have been temporarily removed for the winter months to allow for snow plowing. Caution should still be exercised while traveling around the facility and remember the speed limit posted has always been 5MPH. Additionally, it is not SAFE to back out of the drive thru lanes into oncoming traffic. Four communities with an approximate population of 16,000 utilize the facility. High volume times will mean longer wait time, please be patient with your friends and neighbors, just think of the supermarket before a snowstorm! If you missed the Education Funding 101 forum held in Pittsfield in June 2018. You can join four Lakes Region school districts that will co-host the next community discussion about how New Hampshire pays for public education. The forum will be at held 6:00 pm on Thursday, January 17 in the Belmont High School auditorium, 255 Seavey Road in Belmont. If you haven’t gone to a previous forum, this is a great chance to understand one of the most important issues in New Hampshire. Both the NH House of Representatives and Senate have multiple drafts of proposed legislation that could reform the current funding formula. If you would like to talk to your elected representatives at the NH State House about the changes you would prefer, then the Belmont forum will provide the information you need.